If you are on this site most likely you have a raccoon problem or might have one. We are able to come out and do an inspection of your property to find out what kind of problem you have. The most common locations a raccoon will enter the house is through foundation vents or openings on the roof. Once they are inside they can dig through the insulation and chew on other things. The damage can become very bad, very quickly. That is why we always suggest you have the problem solved as soon as you notice you might have one. 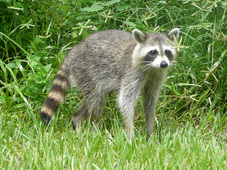 For Oregon City Raccoon Removal Call 503-201-2432 Today!